A government is supposed to protect the interest of its public. But what to do if it becomes the biggest hurdle in their way? Now for the uninitiated, the politics of shipping containers probably sounds like manipulating the trade at the port, not that that was never a problem, but these shipping containers are contributing to the economy around a thousand miles from the shore. In the federal capital and in a very different way too. We had all suffered the consequences of the blockade during the 2014 sit-in protest by PTI and PAT. Now it is time to brace ourselves again to dread getting out on the roads and to find our way out of the gridlock. The question is, who has the time and money? No matter which side you are on, you would be forced to either stay home or join the political tamasha. Can you blame the entire problem on the PTI and Sheikh Rasheed protests? Probably you can, because the containers were not there a couple of days ago. But here they are now. Still, they are not put into place by them. The fact of the matter is that the government can possibly handle this situation in another way. Imposing Section 144 is not the solution to every problem. So I wonder if it is the fault of the protesters or the Federal Interior Ministry itself that people like me cannot go to work when they should be able to on a regular weekday. Of course, we are not fully aware of the reasons why shipping containers are used to block roads, perhaps to block suicide bombing trucks, who knows? But ever since these blockades have started appearing on our roads, the lives of the people of the twin cities have never been the same. While the party in power uses shipping containers to block access from roads, the one in the opposition would use it as a stage to prolong, if not perpetuate, the misery. PTI Chairman Imran Khan’s recent call to shut down the capital is just one such example, which has already sent the stock market crashing even when the actual sit-in protest has not taken place yet. To add insult to injury, he has decided to challenge the orders from the Islamabad High Court forbidding the shutdown. The fact of the matter is that the people want to get on with their lives and are sick and tired of the storms of made-up revolutions that our political leaders like to stir in a teacup. Clearly, most of the people reject the politics of shipping containers, something which could even be a threat to our fragile democracy. But like always, this silent majority remains without a voice. What is even worse is that the government that warns protesters of refraining from interrupting public life is doing all it can to make things miserable for them. This is what the politics in Pakistan have come down to, only to strengthen the ignorant belief that democracy is not fit for a “country like Pakistan.” Whatever that means. Perhaps we cannot get past the days of tear gas because we have not evolved from rioting and destroying to the peaceful protest that is often met with ridicule in our society. Perhaps we would really attain the ideals that we speak so fondly of when we really start supporting peaceful, liberal democratic values on the ground and learn to respect the democratic process. Out of all the rights of the people that the government is responsible to uphold, perhaps the most underestimated in Pakistan is the freedom to access. People are simply too willing to give too much for too little. This reflects the way our government thinks and it also offers an insight into our minds as well. This probably means that our days of living in an authoritarian state are not over and neither is the will to resist it. Or if things have improved indeed, we have still not been able to shake off the hangover from our past of dictatorships. I hope some day our protesters would learn to make their point without blocking roads and that our governments could restore order without taking any lives. Last few weeks have seen people coming together and protesting against the oppression of the “private school mafia”, or as one newspaper puts it, cartel. 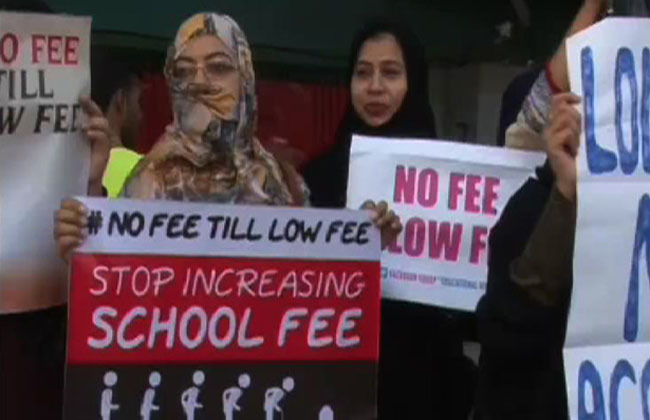 While it sounds really good to save the middle class from the rising prices of private education, most of us have started mistaking these private institutions as government subsidized utilities. Probably it’s not really the fault of a misguided population, which does not like paying any taxes and expects government regulation to subsidize or, worse, enforce a price ceiling. However, this does not take away the notion that the government has no business in regulating the tuition fee rates. Instead of trying to demand a service that they are not able to purchase, people should try sending their children to more affordable private schools. Even better, they are always welcome to try public schools, which are not as terrible as many would like you to believe in major cities. But then again, we have recognized education as a right in the Article 25-A of the cherished 18th amendment, promising the provision of free education up to high school. I totally support the idea, as cruel the joke maybe on the people of Pakistan. And though it is easy to say that we pay enough taxes to fund that, pretty much everyone would agree that public education would need more funding to work. Even those who consider funding public education an unnecessary burden on the taxpayer. However, who knew that the right to free education now means the government forcing schools to lower their tuition fee? This sort of false sense of entitlement is unhealthy and unreasonable. The best thing about the private sector is that it offers you such multitude of options. You don’t need to remain confined to any one choice. You could always reject a private school for its pricing, but those whining why a certain educational institute charges this much to admit students have other goals in mind. You could argue about the greater need of education funding, but that would only mean paying for public schools, unless the government collaborates with NGOs. Apart from the mismanagement and lack of willing workers in remote areas, the public school infrastructure itself is lacking, requiring greater state funding for improved performance. However, complaints about private schools ripping people off are understandable when so many urban citizens rely on private schools for quality education. Now some troublemakers may cite that as an argument against public education, but this does not mean that the public schools are any less popular among people with lower income groups. As a matter of fact, tuition fee subsidies for private school student do not sound like a very bad idea under the circumstances. Though more progressive of commentators would like to see a rather regressive transition of the society entirely to the public schools. But do we need to shove a standard public school system down everyone’s throats? Again, the notion of establishing such social justice and standardization sounds very good to the ears. But it is like enforcing a system and curriculum of education on millions of unwilling people, and is a violation of personal freedom, freedom of education, and arguably freedom of speech. What we need are democratic leaders standing up to this sort of nonsense that populist parties have been feeding to the public, especially if the matter come up for debate in the parliament. However, I hardly expect it from any member of the legislature, though I would be pleasantly surprised if someone did. What we certainly don’t need in the legislature are the sort of recommendations a recent editorial offered, that is, the mandatory requirement for legislators to send their children to public schools in the wake of response to the private educational institute “crisis.” Whether serious or a dark satire in this context, as citizens of a democracy, we need to fight such political ideas of absolutism and utopian mandate in order to preserve individual freedom. But maybe the legislators should be forced to send their children to school to public schools, because they passed the 18th amendment without giving a second thought to what it actually meant apparently. Especially when the national budget allocated for education does not provide for the colossal task. Probably to them it is just a common recurring election promise for all the parties so that they can win people’s vote for its pursuit. Nevertheless, demands for regulating or even nationalizing private educational institutes are everything wrong about Pakistani politics today. This is why people need every service subsidized without paying enough taxes to back the spending. But with political leaders like these, can you blame them? We know that there is not much that we can trust our government with in Pakistan, but there is one thing about which you can be completely certain. You can count on the government to not provide you with any security whenever a violent rioting mob is on the loose. 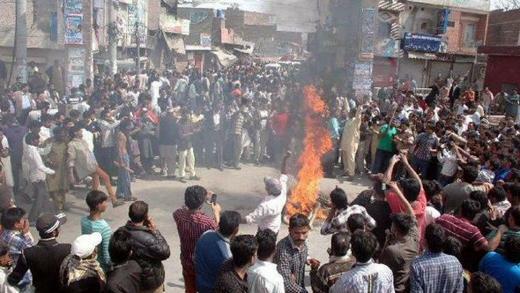 Now, violent rioters in the sub-continent in general, and in Pakistan in particular are not isolated incidents. It’s a pattern, a culture, which is not just openly practiced, but even encouraged by otherwise seemingly sane individuals and political leaders. We have invented a million functions of the government from the regulation of online speech to forcing the prices in the market, but sadly we have completely lost focus of the most essential and fundamental one. Establishing law and order and protecting the lives and the property of citizens. From Gojra riots to Joseph Colony tragedy, Kot Radha Kishan and Sialkot lynch mobs to the Yohannabad violence, and from the Benazir Bhutto assassination riots to May 11 shootings in Karachi, the common winners have been the rioting forces, looters, rapists and criminals. The only losers have been unarmed, defenseless, peaceful, law-abiding citizens. While it is not hard to understand that the government is almost incapable of blocking terrorist attacks, despite its best efforts, it can at least use its police to stop a riot from culminating. Especially considering the recent examples of police violence on violent political protesters in the PTI and PAT rallies in Islamabad. However, stopping a riot is not the usual custom. Especially when the riot is of religious nature, the police prefer to witness the complete carnage instead of taking any action and relying on footage captures for trying to catch the criminals afterwards. In all fairness, sometimes the police have valid reasons too, because no one wants to be tried for murder just because they prevented a crime. But largely, it kills the purpose of trusting the police and necessitates civilian arms. It really does not matter if there are laws encouraging protection of self-defense. It is whether such laws help protect people or not is what is important. I don’t care who the rioters are in any of the several past or future cases. I don’t care who or what they associate with. I don’t care what their grievance is. If they resort to threatening people’s lives and private property, they are criminals. Invoking constitutional right to assembly to justify their madness is not only inappropriate and abusive, but also intellectually dishonest. If they are threatening life and property, the law enforcement authorities are justified to use whatever force is possible to disable and disperse them. Either that, or pay the damages to the victims suffering at the hands of these violent mobs. Sadly, you cannot pay for lost human life with money, if the government ever had the intention to compensate the victims due to their negligence. I don’t see any harm in shooting at a violent rioting mob to disable and disperse them when they are clearly about to hurt people or threaten their property, and a lot of harm in letting them run loose. There is no other way to deal with such threats to public safety. Unless the police are empowered and adequately equipped to do so with reasonable exceptions, I don’t see any end to this culture of madness in the near future. The more humanitarian side of our political spectrum could see the condemnation of mob violence as provocation to further violence or even suppressing people’s rights to protest, but encouraging the culture of mob violence is even worse. They should revisit their definition of hate speech as far as political rhetoric and its impact are concerned. Actually, it is justifying and apologizing for violent riots and tolerating the suspension of law and order which is inviting more unrest and harm. It is precisely the tolerance of state toward violent rioters that brings rioters to the streets more violently than ever before every excuse they get. The way things are right now, you can only perceive the law enforcement authorities to be inviting people to take it to the streets and indulge in violent riots. Because apparently that is the only way your grievances are going to be addressed in this country and nobody seems to have a lot of problems with it either. Any group that is not resorting to violent riots is idiotic, as they are missing out on this tremendous equal opportunity to clinch their rights by burning cites to ashes, robbing banks and businesses, and lynching defenseless people to death. The more enlightened elements of the society are actually losing the battle by just resorting to vigils. If they want something done, say restoring the YouTube, they should begin a riot just like the one that forced the government to ban it. The more oppressed segments of the society, such as the Hazara, should stop with their peaceful protests already. Christian communities in Punjab should stop turning the other cheek as their colonies are burned to dust and should retaliate by burning some more buildings to ground. No aggrieved party should wait for the courts to try the murderers of their people. They should be lynched to death and burned alive. Let the violent mobs run loose on the streets of the country and deliver the swift justice that we have been aching for so badly.